Yuckmouf’s debut EP is South Philadelphia’s 21-minute answer to Sleep’s Dopesmoker, with a violin and theremin thrown in for extra BRVTAL measure. This band is relatively new to the scene, and in some cases, their instruments. Chris Penrod, better known as the moshing chicken at metal shows, literally learned drums to play for this band barely two years ago. These noisy young bucks have wasted no time getting heavy and weird in their short tenure, which began last year with their three song demo Assaulting A Small Amplifier. Psychotic Engines Turn is an even more ambitious follow up, a 21-minute long overture in three movements in which Yuckmouf showcase exactly why they describe their sound as psychedelic hate sludge. The title track begins with a minimalist bass line that reminded me of a cross between Tool and the Seinfeld theme song on quaaludes. Only two minutes in, and it rapidly crescendos into full on stoner rock chaos. Throat man Sean’s Barrett’s crazed screams deliver the primal rage, the theremin’s alien noises add an air of space rock, Thuy Nguyen’s violin spins an improvised-sounding melody, as the bass and guitar riffs of Zach Van Sant and Chris Gore repeat on a loop. Psychotic Engines Turn is a far reaching and complex musical journey, painted in simple strokes. Many bands fall into the trap of unloading riff after riff, or descending into a wall of sheer noise, with no trace of songwriting or memorable compositions. Yuckmouf, instead, are content to stay in the Black Sabbath-paced pocket, sitting on a single motif for minutes at a time before shifting gears in their psychotic engine. I got the feeling these guys enjoy playing off each other in the studio, and left a lot of room for layering melodies in their stretches of doomy jams. What they lack (or choose to streamline) in inventive riffs, Yuckmouf commands the dynamic nature of their music with dramatic crescendos and hushes. 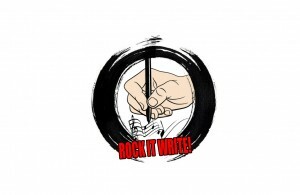 The guitar hooks are bare bones, but the delivery swells and hits with wave after wave of raw emotion and aggression. They also manage to stick to a simple formula that kept me, the listener, interesting and interested. Many lesser sludge bands miss this important balance and fade away into background that pairs well with bubbling bong rips. Around 12 minutes in, the music lulls and gives way to an acoustic, Egyptian guitar scale, as the harsh vocals wail on. It’s a really eerie moment that made me feel like I was being sacrificed at the base of a pyramid to Set. The final two minutes of Psychotic Engines Turn proved to be the strongest for me. A familiar sounding doom riff from earlier in the song triumphantly returns at a perfect pace to bang your head and pump your fist, flanked by dueling guitar and violin leads, that harkened to shades of Black Sabbath and Judas Priest. I’m excited Yuckmouf’s future, and I hope they crank out more riffs, faster tempos, and music that continues to sound increasingly alien and psychotic. Listen for yourself at Yuckmouf’s bandcamp and order their new EP for as little as $1 to get a bonus track. 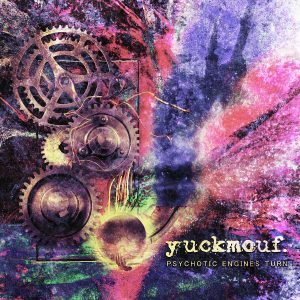 Psychotic Engines Turn by yuckmouf. About the Author: The Necrosexual is the most electrifying man in corpse entertainment. His upcoming album The Gory Hole Overture In F# is available for digital preorder here.